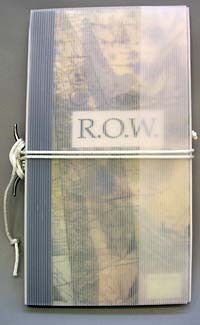 The central image used in R.O.W. 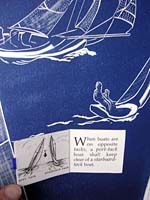 is a three foot square relief print which was created as part of a program at the San Francisco Center for the Book. It was originally printed in 2005 by a steamroller at Carolina and 16th Streets, San Francisco. Kay Bradner and Charles Hobson collaborated on the design of the print which is printed on Rives BFK 300 gm paper. Available from Priscilla Juvelis, Inc., Kennebunkport ME, www.juvelisbooks.com, or Donna Seager Gallery, San Rafael, CA www.donnaseagergallery.com. 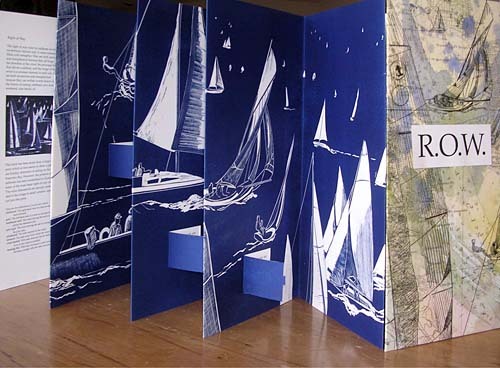 The book has been made from segmenting the large relief print which at first seems to show a pleasant Sunday afternoon of sailing on the San Francisco Bay. 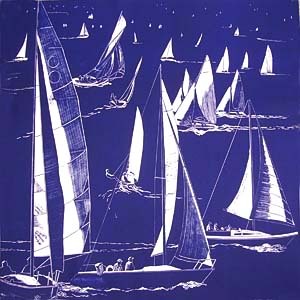 However, the position of the sailboats has been established to illustrate some of the most basic right-of-way rules. The rules themselves are actually embedded in the image in small window openings cut into the print. It is covered in a transparent corrugated chemise which is closed with sailing line and a cleat. Kay Bradner is a distinguished printmaker and painter who has collaborated with other artists for more than thirty years in producing masterful prints in relief, intaglio and monotype methods. Her recent images exhibit a passion for water and the vessels that move upon it. Charles Hobson is an artist who has worked extensively with the juxtaposition of word and image in painting, monotypes and artists' books. 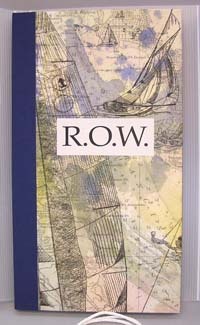 He is a faculty member at the San Francisco Art institute and at one time raced a Cal 20 sailboat on the San Francisco Bay where he had first hand experience with the application of the right of way rules.